It’s official. Cancelled soaps All My Children and One Life To Live will live on as online dramas. Prospect Park has released a press release and will offer furth details in the next few weeks. 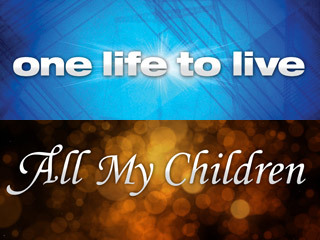 We are pleased to confirm that Prospect Park is reviving the beloved soap operas, All My Children and One Life To Live as the anchor programs on The Online Network (TOLN). 4) arranged the necessary financing to begin production in February on both All My Children and One Life To Live. We thank the loyal audience and new generation of fans of both shows who have demonstrated that passion and exciting story lines are not just reserved for traditional television. Their enduring support encouraged us to move forward each and every day. We look forward to sharing more details including our launch air date and additional specifics in the coming weeks. Please encourage fans to visit http://www.theonlinenetwork.com/ to subscribe to updates. What do you think? Are you glad to hear that the soaps are returning online? Do you have any apprehensions about how the revivals will be handled? It would be awesome if, SoapNet was able to show the episodes too. I wonder what’s going to happen with all the OLTL characters that went to GH. Didn’t they kill Hope & Cole off? So would Starr be without both of them when OLTL starts…. I’m still wondering who was shot on the AMC finale….hopefully we will find out soon. I am glad that they have finally come to some decision and seem to have the organizational aspects in place. I wonder about the casting, however. I was a late-arriving All My Children fan because of a guest star, and when he left…I didn’t. I don’t fancy watching it on my computer…not especially comfortable…but I am very interested to see what happens! Will be very happy if oltl is revived !!! I’m soooooo happy to hear this . All my children is my baby was not a happy camper when taken off, but now sooooo happy. I am thrilled with this news. I have missed OLTL more than I can say. Both shows are such important parts of American television history and should have never been taken off the air. I certainly look forward to their return. Thank you Prospect Park.